OCTOBER MUFON - UUFOH Meeting: Hunter Library on Oct 26th at 2pm 4100 S and 4800 W.
Our guest speaker was Kim Peterson a returning guest speaker at the Mufon/Utah UFO Hunters meeting, Kim doesn't use the title of shaman but he has many attributes and habits of a shaman. He spoke of his awakening after his accident. His visions and spirituall travels. "Father" and his living in the Basin. Utah's Underground, Caverns and tunnels. Various power places, and more He is very humorous and intertaining. and we welcomed him back. We had new member Robin Hoefer & his lady show up! We hope they enjoyed the meeting. It was another great turnout... we hope it continues to be "the must do, have to be there" thing of the month. ALIEN DAVE'S - 98' ROSE PARK UFO, 97'-SMITHSFIELD CROPCIRCLE, - OTHER UFOS - & SOME SOLAR ELIMINATION TECHNIQUE UFOs ? We missed Richard & Anne, Scott Hart, Susan, Merri, etc. we hope to see you next time, Thanks to all that made it. Check our members page for photo of The UUFOH Members that showed for the group photo. & photo right for meeting photo. Research Methods in Psychology. In addition, he teaches courses on the Psychology of Consciousness and Parapsychology. Dr. Atkinson does hypnosis, meditation, and restricted environmental stimulation research, and has published numerous articles in professional journals on these topics. In addition, he is an active member of the Utah Paranormal Exploration and Research (UPER) group (www.UPER.freewebspace.com), through whose auspices he conducts ghost investigations. He is particularly interested in electronic voice phenomena (EVP), and will be presenting some of his ghost EVP on the March 18th Jeff Rense "Sightings" program from 8:00-11:00 pm mdt(630 AM locally or www.rense.com). Dr. Atkinson's website, "Paranormal Borderlands," may be accessed as a resource for some of his ghost research methods and findings (www.paranormalborderlands.com). Victoria Liljenquist was our first speaker, she showed her UFO? Video from the 21st UFO Fly-by. and some other Video, she spoke and answered questions. Our second guest speaker. Lanaiya King is a "Medial Intuitive' and a specialist in understanding energy flows of the body and how they impact perfect health. She has the ability to clear physical and emotional trauma and assists in helping move into higher states of awareness. She's a medical intuitive so can see into body's and help to balance the body. Does things on all levels-information and insight. Brad Staley was our final Speaker, talking about his new show. "Utah Paranormal"
May 2002 MUFON Meeting -18th.Hunter Library - 4800 W 4100 S 2:00 - 5:00 pm. Bobbi lent us a video of a panel of women experiencers which was taped in Missouri in 1993 at a conference put on by John Carpenter, a hypnotherapists. Most of the women had been his clients and had been to see him to explore their meetings with ET's. Bobbi read an article by J.J. Hurtak, author of The Keys Of Enoch. He wrote about the new energy the planet was moving into. "This is the third year that the earth will experience a substantial Light shift in May. This is due to a change in direction of the entire planetary system in which you reside. Three years ago the ascension proces began to move your reality, and your planetary system began to move toward a new resting place in heaven." This coincided with what the women on the panel had been told by the ET's. Susan brought a home video she'd bought at a small UFO conference she'd been to in Colorado. The fellow had taped over an hour of a unidentified vehicle, including one shot that had the corner of his house. He'd added several other shots taken from different TV programs. It was difficult to see because of the quality of the TV and video equipment. However we all enjoyed sharing information after the video. childhood. She is a Master Hypnotherapist, has had 6 years of Light-Body Training with Alberto Villoldo and Advanced Intensive certification in Soul Retrieval, Divination, Sorcery, Rituals, Despacjo, Archtypes. Joy talked about her abduction experiences, explained some things about shamanic journeys, her personal journeys around the world. and took us on our own journey to the underworld. A very interesting, and "Joyfull" guest. A GREAT MEETING ! Thanks JOY For speaking! Kim Peterson was our guest speaker at the Mufon/Utah UFO Hunters meeting, Kim doesn't use the title of shaman but he has many attributes and habits of a shaman. He spoke of his awakening after his accident. His visions and spirituall travels. Father and his living in the Basin. he was very humorous and intertaining. then, Don, Susan, Ryan and Alien Dave talked breifly about thier trip to the Teton City Cropcircle. It was a very good turn out, with some new UUFOH Members showing ( Dan Kenyon & Don Rogers) among others. There was a pot luck at Marlee's after the meeting, which was very intertaining with Kim's story's and jokes, Wizard Dave showed some of his collection of rocks and crash debris. Alot of talk and conversation, And folks made donation's to help pay for Kim's trip from Duchesne..
Hunter Library on the 21st at 2pm 4100 S and 4800 W.
shows. 'Dharma Diamonds', his paranormal novel is available on http://alanmeyer.com thru a link to his publisher. At the meeting, He showed videos of the Teton crop circle mystery light, his Ghostwalker video that showed Orbs in the old spookalley in Ogden, and Alan Talked about his 1967 Bigfoot experience, his Dimple Dell Vortex experience, Rods, his childhood "Ghost" experiences, and gave demonstrations on connective energy. He considers himself a Sensor, and is very aware of other realities. - Great Stuff! - please check out his website for some amazing Orb photos! etc. We had a showing of the film at the Oct 19th UUFOH-MUFON meeting. A Great turn out ! with as many as 20 showing to see this excellent film, at the first of two meetings planned this month. We discussed the film afterwards, and wrote reviews for Kim & William. We also discussed the Teton Cropcircle, ORBS, and many other subjects.We met new UUFOH Member, Rick Bos who will be our guest speaker next month. We headed to Village Inn after for more conversation over viddles. It was great to see you all again! Thanks to all that attended and participated. Here's what The Utah UFO Hunters, wrote to William & Kim after seeing the film, "We all had different impressions with this film. Thats what Cropcircles do to people, make them think." "They are teaching tools for the modern mind". "This is a film informatively showing a beautiful and wondrous mystery, Cropcircles. Leaving the question of how and why open to discussion with an open mind, new perspectives, and a informative script. We all learned something from this film. Impressive, Informative, Balanced, and Enlightening. A well done, long over due documentary, Excellent work." "You and Dave have a far superior paranormal group to any other I've seen." 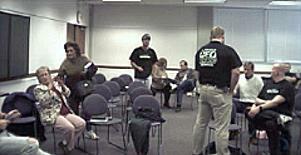 Hunter Library on NOV. 30th at 2pm 4100 S and 4800 W.
We had a great turnout and would like to thank all that attended. Our guest speaker was RICK BOS A new member of UUFOH. Rick Bos has lived in various locations in the U.S. as well as a number of years in Europe and Brazil. He has a bachelors degree in Brazilian Portuguese and a MBA in international business. He is also an accomplished rock guitarist and vocalist, having played in various rock bands since 1961. works in the audio industry and backstage with Ozzy Ozbourne,& Black Sabbath. In 1993, while living in Meridian, Mississippi, Rick joined the Gulf Breeze, Florida UFO research group and was heavily involved in the Project Awareness conferences and later the Journeys Beyond conferences as the sound engineer. He was also a speaker and a panelist at two of these conferences. While at a skywatch in Gulf Breeze at Shoreline Park, Rick got a daylight photo of a boomerang craft with a ball-probe hovering below it. Rick was also at Roswell for the 49th and 50th anniversaries of the crash. In Rick's lecture he discussed how in 1970, while serving as a missionary in Brazil for The Church of Jesus Christ of Latter-day Saints, Rick helped a high-ranking leader of a Condomble spiritualist sect leave that group. Condomble is a particularly virulent form of spiritualism, and in retaliation for Rick's actions, the Condomble group put a death curse on Rick. As a result, for the next 15 years, and again in 1995-96, Rick, and later his family, were subjected to hundreds of poltergeist encounters and hair-raising spiritual attacks. Rick has also noted a strong similarity in symptoms between spiritualists who are possessed, people being subjected to spiritual attacks, and alien abductees. In his lecture Rick shared many of these experiences along with slides and video footage, presented his conclusions about who and what are behind these attacks, the purpose and agenda behind abductions, mutilations and spiritual attack, and told how he was able to protect himself and his family each time the attacks started. Rick is nearly finished writing a book about these experiences, which also includes his research into the similarities between demonic entities and aliens, and his conclusions about their agendas. His book is titled, Under Spiritual Attack. We welcome Rick to our group and thank him for being our Nov. Guest Speaker, We all thought his lecture was very interesting. We also seen Troy and Chris Wood from the Utah Ghost Organization www.utahghost.org and Andrea Wright, a reporter doing a Sasquatch article. Also, Alien Dad - Don Rosenfeld Alien Dave's father who quite enjoyed the meeting. We met afterwards at Village Inn for more paranormal talk and updates over coffee and grub. Hunter Library on DEC 28th at 2pm 4100 S and 4800 W.
Our guest speaker was Don Rogers. a member of UUFOH who is working on mapping UFO Flight Paths. He demonstrated and explained the UFO Fight Pattern Investigation Tool, how to make one, how to use it and the benifits of the data. He also talked about his "not so nice' abduction experiences.and encounters He has worked with mainframe computers for most of his life and worked for government contractors at Hill Air Force Base and Yuma Proving Grounds (Army). " Don's BIO: He first attended a UFO meeting when he was 12 and went to a UFO lecture with his mother in the 60's. Ever since then he has read a great deal about UFO's and followed them as much as possible. In high school, his sister and friends conducted many experiments with telepathy. After learning how to "tune in" to a person's "frequency", they were getting very successful results.He also seems to have fairly good telepathic communications with his Mother. For a while, his father had a farm in the middle of the desert 50 miles west of Idaho Falls and bordered on the south side of Atomic Energy Commission (AEC as it was known then) nuclear reservation. They lived in a tiny town called Atomic City and everyone who had lived there for a long time had stories about seeing UFO's flying over the reactors. It was rumored that there was a jet fighter stationed there for the sole purpose of chasing the UFO's and that it was "scrambled" several times a month. They said the late fifties and early sixties was the busiest time of the UFO's. Many of them also believed that there must be a UFO base in the Idaho mountains because they always came from, and returned to, the central Idaho mountains. This is why I have an interest in tracking the UFO's flight paths. Don has had four night and two daytime sightings of what he believe's were UFO's. We also used to see lights in the desert where we knew there were no roads. On two occasions the lights were close to our farm and lit up such a large area of the desert that we decided to investigate it the next day. We never did find the location of the lights, but we also couldn't find any vehicle tracks that we were planning on using to lead us to the spot. So, this is a summary of my UFO experiences before my "abduction." After my experience I've tried to avoid any situations where they could "pick me up" again. With our extra time, Alan Meyer talked about his before and after experiences when he took Eric Scott Pearls DNA Reconnection class.and gave a demonstration.